About six weeks ago, I was calculating how far away Christmas was and, since I am often thinking about sewing, I was thinking that around this time (now), many sewer/bloggers would start thinking about what special outfits they might make their child/children for Christmas. I love Christmas and for the past few years, I have sewn my daughters a new dress to wear on Christmas day. 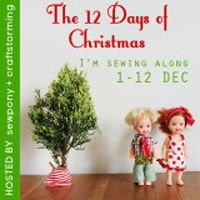 I thought it would be fun to start a series that invited bloggers to share their Christmas creations in one central space over the 12 days of Christmas, the 1-12 December. So, I got to work emailing some blogging friends and also some bloggers I really liked but didn't yet know well. Nearly everyone was keen and free. Yay! I then decided to branch out and ask one of my guests who I didn't know well to co-host the series with me. I asked the lovely Laura of Craftstorming who blogs from England about sewing and baking. Her stuff is awesome, and I knew if she said yes, we would have a successful series. Well, she did...and The 12 Days of Christmas was born!! All going well, we plan to host The 12 Days of Christmas annually. 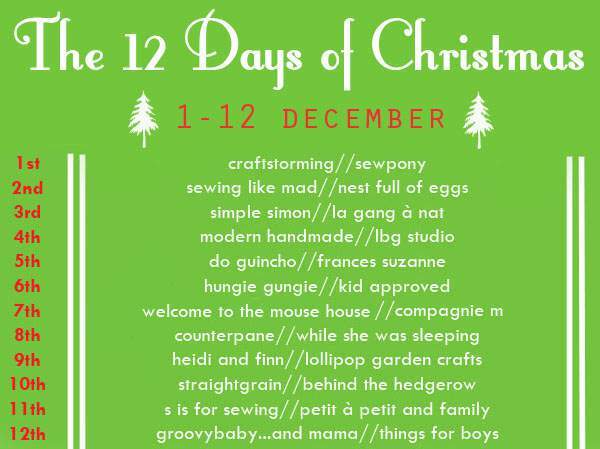 So from the 1-12 December, Laura and I will host 22 bloggers (plus ourselves) and will share what we have made for our children as well as how we spend Christmas now and also share some of our favourite childhood Christmas memories. We will synchronise our posts to publish at 9pm Australian Eastern Daylight Savings Time over these days. Sound good? Now...who are the guests? You can hover and click on any of the blog names on this calendar to visit that blog (thanks to Laura's excellent tech skills!). (When you click on the link, it will open in the same window). We are excited!! 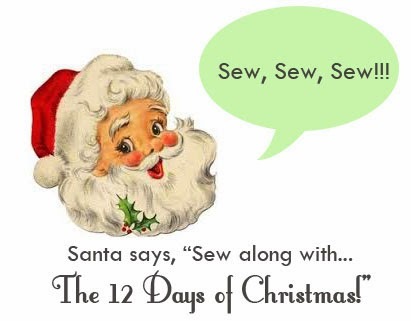 And we hope you are excited too and would love you to sew along and tune in here at sewpony and at Craftstorming from the 1-12 December!! Thanks for your sweet comments and for asking me to co-host. I can't wait for this to start! I have a few ideas, but I better get started fabric shopping, pattern searching and sewing! How exciting is this!!! Woohoo!!! Now if only I can stop changing my mind about my pattern every two minutes... hahaha! You have a skill for coming up with really interesting series' Suz! Can't wait to read about everyone's different Xmas traditions, how fun! What a lovely idea! I look forward to seeing all the creations! This should be excellent! I'm looking forward to it! I'm so excited! This is going to be great and inspiring for sure!!! so happy to be a part of it, Suz! Awesome lineup of talent!! Thrilled to be a part of this series....our sewing has commenced, and I plan to dig through old photo albums tomorrow for "Christmas Traditions" pictures. FUN!! Yay! I've worked my list down to a top 3...need to work on that! I am beyond excited for my favorite holiday and also to be part of this series! I can't wait for this series to start! Thank you so much for inviting me, Suz! I can't wait to see all other Christmas creations. Oh, I can´t wait for this series to start!